One of my favorite places on this amazing earth of ours is the idyllic island of Bali in Indonesia. In the past 25 years, I have been lucky enough to visit Bali approximately 50 times and have done probably six planning projects there. One of my all-time favorite projects was Nirwana Bali Resort. Back in the early 1990’s Bali was relatively undeveloped and larger master planned resorts were just starting to pop up all over the island. One afternoon in 1993 I was sitting in my office and my friend, Ron Holecek who was with WATG called me. He asked if I would like to work on a new resort property in Bali. Of course I said I would love to. Well, as it happened, Ron was in the middle of a meeting with the client. He asked if I could get him a proposal in the next hour and he would try to get it approved. So, I quickly prepared probably the fastest proposal I have ever done. I put it on the fax machine (yes, there was no e-mail back then) and sent it off to him. Thirty minutes later, the fax machine came on and out came a signed contract! That is, I am sure, the fastest we ever secured a project! In the early 1990’s Bali had a lot of small boutique hotels, but only one large resort development at Nusa Dua. 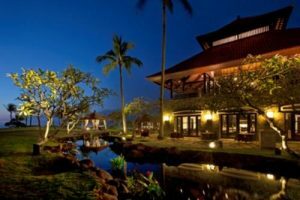 The Nirwana Bali site was located about 45-minutes from Ngurah Rai International Airport on a spectacular oceanfront site over looking the famous Tanah Lot Temple. It was covered with beautiful terraced rice paddies and had views to Mount Agung, Bali’s tallest volcano peak. The project team initially included ourselves, WATG and Greg Norman Golf Design. Eventually, my good friend, Alan Clarke of Tong Clarke and McCelvey was added to the team as the landscape architect. The development program for the resort included a 350 room hotel, which was to be run by Le Meridien (now a Pan Pacific Hotel), an 18-hole golf course and about 400 residential units including bungalows, townhouses, villas and timeshare units. We initially gathered in a meeting room at our hotel in Nusa Dua and began tossing around concepts and ideas. Eventually Bob Harrison, who was Greg Norman’s chief designer and I had come up with a preliminary routing for the golf course. We then headed out to walk the site and test our ideas. After checking out the proposed hotel site, with the architects, Bob and I were walking around the proposed golf course site seeing if our ideas made sense. A portion of the proposed course ran along the ocean which was dotted by several small bays and inlets. We stood on the tee of a proposed par three that we were envisioning playing across one of the small bays. It looked like a pretty nice hole. We then walked on to where the green was supposed to be located. When we arrived, we happened to turn around and look at the view to the tee. Well, we were overwhelmed. From this point, the Tanah Lot Temple was located just offshore to the left and Mount Agung was directly in the background! We both immediately realized that this would be the course’s signature hole! All we had to do was reverse the golf course routing to take advantage of this spectacular view. In addition, there were three other spectacular golf holes developed along the oceanfront. The remainder of the golf course winds up and down the picturesque slopes surrounded by beautiful rice paddies. Eventually, after Alan Clarke joined our team, we collectively came up with the idea of making the existing rice paddies the central element of the landscape concept. We adapted the land plan to work well with the existing rice paddy terraces and a large number of the existing paddies were retained and maintained as not only key landscape features, but working paddies which were maintained by some of the local farmers. WATG designed a beautiful four star balinese style hotel nestled into the landscape with exceptional ocean views. As we finalized the master plan and Greg Norman Design finalized the golf course layout and design, approximately 400 residential units were strategically placed on the site, many with spectacular ocean and golf course views. The resort opened in May of 1997. The resort has won the World Travel Awards designation several times as “Indonesia’s Leading Golf Resort”. 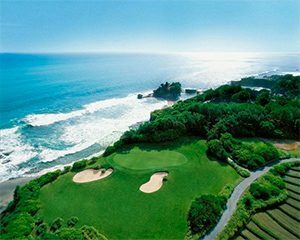 The Nirwana Bali Golf Club was listed in the “World’s Top 100 Greatest Golf Courses” by Golf Digest Magazine in 2012 and 2014. It was named one of the “World’s Best Golf Courses outside of the US and Number 1 Golf Course in Indonesia” by Golf Magazine. Both the hotel and golf course have received Certificates of Excellence from Trip Advisor.